Happy Days is a new annual festival celebrating the work and influence of Nobel Prize-winning writer Samuel Beckett. The inaugural Happy Days takes place 23rd – 27th August 2012 with free visual arts events from 3rd July. The Festival is collaborating with the London 2012 Festival, the culmination of the Cultural Olympiad, and coincides with the 400th anniversary of the founding of Enniskillen. Happy Days is the first annual, international, multi-arts festival in Northern Ireland since the launch of the Belfast Festival in 1962. As with the Edinburgh Festival in 1947, Happy Days will be a major cultural event bringing diverse communities together, mixing local and international audiences and artists. Plus a range of events reflecting Beckett’s favourite sports. Happy Days is funded by Northern Ireland Tourist Board, Arts Council Northern Ireland, Fermanagh District Council and the London 2012 Festival. I am delighted to return to where my professional festival career began (Derry 1992) and where I had many rewarding artistic experiences as Artistic Director of the 1997 & 1998 Belfast Festivals. Enniskillen International Beckett Festival is a perfect complement to the wide range of events that already take place around the Fermanagh Lakelands. Culture is a key ingredient that sets Northern Ireland apart from competing destinations, and festivals such as this are crucial in attracting visitors. Innovative events help to raise the profile of a destination and I have no doubt this initiative has the capacity to grow to a level where it can attract overseas tourists. It will benefit the local economy by generating additional spend on accommodation, hospitality and travel. I’m delighted that this festival, dedicated to one of the greatest world writers Samuel Beckett, will be collaborating with the London 2012 Festival. 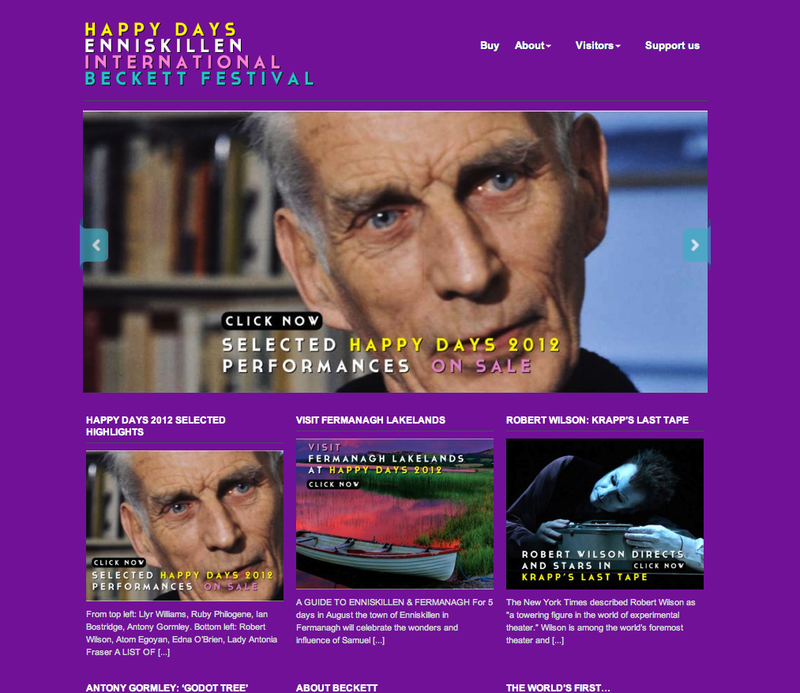 With world class writing, comedy, music, and amazing scenery, Happy Days is bidding to become one of the great world festivals and we’re pleased to be supporting it. For more information about the event and how to book, visit the Happy Days website.